Reheating furnaces constitute an important element in the rolling of steels, in which the semi-finished steel products are heated to a desired temperature for achieving the plastic properties in the products for rolling. The basic purposes of heating the semi-finished steel products for rolling include (i) to soften the steel for making it suitable for rolling, and (ii) to provide a sufficiently high initial temperature so that rolling process is completed in fully austenitic temperature region. During reheating in the reheating furnace, steel is passed through the furnace along which the temperature is gradually increased up to the soak zone. In there, the temperature is kept constant for thermal and chemical homogeneity of the steel. The reheating furnace is a direct fired furnace which uses either of the gaseous, liquid, or solid fuel and air. The composition of the atmosphere within the furnace generally consists mainly of nitrogen (N2), Carbon di-oxide (CO2), water vapour (H2O) and free oxygen (O2). The atmosphere composition can vary drastically during the operation. These variations are functions of the air/fuel ratio, which in turn, depends on furnace and mill operating conditions. Reheating furnace for the reheating of steel is conceptually divided into three zones. Starting from the discharge end of the reheating furnace, these zones are (i) soaking zone, (ii) heating zone/zones, and (iii) pre-heating zone. In the soaking zone, fuel and air is fired through the furnace burners at normal or reduced primary fuel stoichiometry. This zone has high furnace temperature. The temperature of steel is equalized through its cross section in this zone. The exhaust gases from this zone travel to heating zones. The heating zones, which are between preheating zone and the soaking zone, require high radiant heat transfer for increasing the steel surface temperature up to around rolling temperature. O2 enrichment of combustion air in these zones promotes heat transfer and decrease furnace volumetric gas flows, all with the beneficial result of increased productivity and thermal efficiency. In the pre-heating zone, the flow of gases from the preceding zones, provide heat to the incoming steel mainly by convection. Additional air is added in the beginning of this zone or at the end of heating zone to burn all remaining fuel remains. The sensible heat of the exhaust gases is recovered by heat transfer to the steel or in the recuperator. The velocity of the gases in this zone is to be as low as possible so that more residence time is provided for the transfer of heat to the steel. During the heating of steel in the reheating furnace, hot steel surfaces react with the in-furnace oxidizing atmosphere resulting in the formation of an iron oxides layer known as scale. The yield loss due to this phenomenon can range from 1.0 % to 3 % of reheated steel. The oxidation of steel to form scale is a basic, and, generally, unavoidable consequence of the reheating process in a reheating furnace. Major consequences of the scale formation are the significant economic losses incurred in two main areas, namely (i) loss of yield of steel as iron oxides, and (ii) loss of prime quality product through defective surface caused by rolled-in scale defects or roughened surfaces. The scale constitutes a loss of valuable steel. Scale formation is a complex reaction which takes place in the reheating furnace. The morphologies and microstructures which develop during the heating of steel in the reheating furnace treatment are considerably modified by scale formation and transformation. The amount of scale formation during the reheating of steel in the reheating furnace depends upon several factors. These factors include (i) the composition of the steel, (ii) the initial steel surface condition, (iii) the temperature of reheating, (iv) the composition of the atmosphere of the reheating furnace which determines its aggressiveness towards scale formation, and (v) the time of residence in the furnace which is determined by the reheating cycle. In order to be able to predict the effect of changes of reheat parameters upon the resultant scale formation, it is necessary to have oxidation data available which corresponds to varying furnace conditions. Also, improved control of the furnace atmosphere enables a lower and more stable O2 content and hence reduction of loss of steel through scale formation. The phenomena of scale formation (oxidation) on the steel surface during reheating of steel material in the reheating furnace are unavoidable and difficult to control. Disadvantages of scale formation include steel consumption and scale fall out in route to rolling mill, which requires clean up and usually cause environmental issues. The mechanism for the high temperature oxidation of steel is given in Fig 1. The oxidation mechanism can depend on (i) the transport of oxidant gas from the bulk gas phase, (ii) phase boundary reaction(s) at the gas/scale interface, or (iii) the diffusion of Fe cations to the scale/gas phase interface. Scale formation of steel in the presence of gaseous products of combustion adds to the complexity of the oxidation process in the reheating furnace. A major element in this complexity of scale formation is the inconsistency, which again, is a result of interacting parameters in the reheating furnace. A saving of up to 35 % of steel lost to scale can be achieved by reducing the excess air in the furnace from 70 % to 20 %. Also, longer residence time and higher temperatures of the steel in the furnace results in the formation of excessive amounts of scale. There are normally two sources of O2 in the reheating furnace. These are (i) combustion air which is supplied to the burner for the combustion of the fuel, and (ii) air ingress which happens when there is a negative pressure in the furnace which is created due to various reasons and this leads to air ingress into the furnace atmosphere. The normal or conventional heating of steel to rolling temperatures is to heat steel in a reheating furnace which is being fired by burners operating at or slightly above the stoichiometric ratio of the fuel being used. The 100 % stoichiometric ratio is defined as the air/gas ratio that yields perfect combustion of the fuel and yields a flue gas atmosphere that is made up of only N2, CO2, H2O, and there is no free O2. Combustion at an air/gas ratio slightly above 100 % stoichiometric results in a small percentage of O2 also in the flue gasses. As the steel stock moves forward through the reheating furnace, its temperature rises. However, the rate of the temperature increase depends on the firing rates in the individual zones of the furnace. In the early stages of reheating, the steel stock is exposed to low heating rates to avoid the development of thermal stresses. The steel stock is then exposed to intense heating up to the soaking zone, where the soaking temperature is maintained to achieve a uniform steel temperature for the subsequent rolling. As the steel surface temperature rises, it reacts with the furnace oxidizing atmosphere (O2, CO2, and H2O etc. ), to produce an oxide layer (scale layer). The thickness of the scale layer depends on several factors. There are a number of advantages and disadvantages to scale formation on steel. The advantages are namely (i) scale eliminates surface defects such as impurities of mould powder embedded in the surface from the continuous casting machine, oxides and surface cracks, and hence results in smooth and clean steel surface, (ii) the heat given-off to the steel during the oxidation process being an exothermic reaction, accounts for around 2 % to 3 % of total heat input, and (iii) the scale layer reduces the heat flow from the steel to the environment (due to its lower thermal conductivity) when the steel is transported to the rolling mill. The disadvantages of scale formation during reheating of steel in a reheating furnace include (i) steel loss ranging from 1 % to 3 % depending of furnace operating conditions, (2) scale pile-ups inside the furnace and heated steel transport path which requires a furnace shut-down period for cleaning and (iii) slowed down heat transfer from the furnace environment to the steel necessitating longer heating periods. It is important to minimize the scale formation during reheating to a level to which it is advantageous. This makes it necessary to monitor and control all the relevant parameters during the operation of the reheating furnace. The subject of high temperature oxidation of steels under different conditions has been studied extensively. Theoretical consideration of the oxidation of pure metals shows that there are two principal control mechanisms. Initially, there is a linear growth of the scale when the rate of oxidation is determined by surface chemical reactions. This generally lasts for a short period of time until the scale layer becomes established and the rate of diffusion of one of the reactants through the scale layer becomes the controlling mechanism. In the case of pure iron, it is the diffusion of iron outwards from the metal/scale interface which controls the rate of oxidation. This leads directly to the parabolic law that the weight oxidized per unit area is proportional to the square root of the elapsed time. When steel is heated in mixed gas atmospheres, as is the case in the reheating furnace, marked deviations from the behaviour of pure iron is usually observed. This can result from the alloying elements in the steel. These cause numerous deviations from the classical growth mechanism, one of the more obvious being the inhibition of dislocation movement under the action of surface stresses generated by the scale growth· This favours the generation of a line of pores or gaps at the metal-scale interface which inhibits iron diffusion and result in lower scaling rates. Furthermore, it is often difficult to distinguish an initial, discrete period of linear oxidation whilst significant deviation from the parabolic law, throughout the whole of the oxidation period, is frequently observed. The scales formed on steels often contained cracks which, if normal to the metal-scale interface, have given rise to alternative pathways for oxidation gases to be transported through the scale. This means that diffusion through the scale is no longer is the controlling mechanism and enhanced oxidation can result. These cracks may have arisen from the escape of gaseous oxidation products such as carbon monoxide (CO), from the scale-metal interface or as a result of the stresses generated during scale growth. The geometry of steel can also influence the generation of cracks in the scale. The flue gas constituents of CO2, H2O and O2 are all oxidizing to steel when the surface temperature of the steel is above around 750 deg C. For oxidation of different steels in CO2 and H2O atmospheres, the limiting step is found to be the rate of dissociation of CO2 or H2O to O2 and CO or H2 on the oxide surface. However, for oxidation in O2 atmospheres, the limiting step during the initial period of oxidation is found to be the rate of the transport O2 from the gas phase to the reaction surface. After the oxide layer reaches a certain thickness, oxidation follows a parabolic rate law where the rate of oxidation is controlled by the diffusion of the ionic species and vacancies through the oxide layer. The effect of O2 levels on the rates of oxidation of iron at 700 deg C, 800 deg C, and 900 deg C shows that the parabolic oxidation rate increases with increasing O2 percentage, especially at higher temperatures. The most significant increase takes place between 0.4 % and 2 % O2 at 950 deg C.
The effect of water vapour and CO2 on the oxidation of iron shows that the scale formation rate of iron is not influenced by water vapour at 750 deg C, but at 850 deg C and 950 deg C, the rate increases by factors of 1.2 and 1.6 respectively. It is also seen that CO2 produces a smaller increase than water vapour. In case of CO2 oxidation of iron in the temperature range 600 deg C to 1100 deg C, it is noticed that the scale formation rates follow linear and parabolic time laws for short and long exposure times respectively. The dependence of oxidation rates on temperature is well established and is known to obey an Arrhenius relationship (This relationship indicates the temperature dependence of reaction rates). In general, oxidation can be classified into three stages namely (i) an initial stage characterized by a linear type of oxidation, (ii) a final stage where oxidation is parabolic, and (iii) an intermediate stage where a transition from linear to parabolic mechanism takes place. The scale formation is strongly dependent on surface temperature of steel and its residence time in furnace. It also depends on percentage of O2 present in combustion product. Temperature has its influence on the oxidation of steel. At low temperatures (900 deg C and below), O2 content has very little influence on oxidation of steel. At high temperatures (1150 deg C and above) increase of O2 content in the furnace atmosphere from 0.3 % to 3 % increases the oxidation rate by 50 %. Further increase of O2 level above 3 % has little effect on the oxidation. Oxidation in complex atmospheres such those exist in the reheating furnace, however, shows that oxidation in multi-component gases can cause the three mechanisms of oxidation all together. 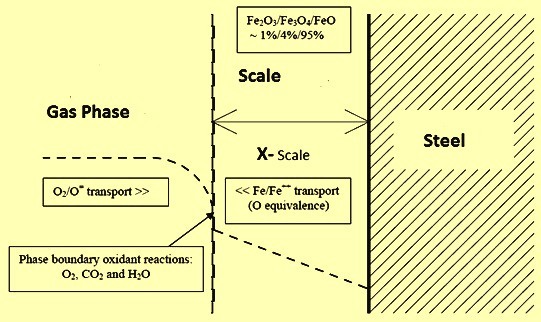 It is well known that the iron (Fe) oxidizes to form three well known oxides, namely, wustite (FeO), magnetite (Fe3O4) and hematite (Fe3O4) in proportions determined by reaction kinetics, where the predominant oxide being magnetite. The basic understanding of oxidation is that after the initial stage, the process proceeded by the outward diffusion of iron (Fe 2+) to react with oxygen, supplied by the furnace atmosphere during reheating. The process is defined as proceeding at parabolic growth rates, leading to the formation of three layers of oxide types, namely, FeO, Fe3O4, and Fe2O3 progressively, from the metal surface outwards. Wustite is the inner most phase of the scale which forms next to the metal and is the Fe rich phase. It has the lowest O2. It is represented as FeO, and is not stable below around 570 deg C. However, it’s content in the scale increases with increasing temperature and occupies around 95 % of the scale layer when the steel temperature is above 700 deg C. The density of wustite is around 5.87 g/cu cm. Wustite exists as a thermodynamically stable, single phase structure, over a wide range of composition. The non-stoichiometry of wustite increases with increasing temperature and does not seem to reach the stoichiometric composition FeO. Compared to the other scale phases and the steel itself, the wustite phase has a relatively low melting point, which is from 1370 deg C to 1425deg C. Melting of the wustite layer (washing) accelerates the scale formation rate and increases the grain boundary penetration. This not only reduces the surface quality, but also increases the fuel consumption of the furnace and reduces the yield. Reheating furnace is a direct fired type furnace. Many reactions can take place during reheating; however the main reactions that provide heat in the reheating furnace are as follows. The product of combustion is always highly oxidizing and rate of scale formation increases with the increase in the surface temperature and the partial enrichment of O2, and carbon dioxide (CO2) in the furnace atmosphere. The rate decreases as the partial pressure of carbon monoxide (CO) increases. The O2 percentage in product of combustion is normally maintained at around 1 % to 2 % to minimize the scale loss. The levels of combustion products depend on the percent of the combustion air used. In case of complete combustion, the combustion gives rise to products of complete combustion. It can be noted that as the percent of the combustion air decreases, the oxidants H2O and CO2 decreases, while those providing reducing environment to the furnace such as CO and H2 increases. The air/gas ratio also has a big impact on the adiabatic flame temperature. Generally, the high combustion air temperatures result in dramatic increases in flame temperatures. Various studies have been made on the impact of air/fuel ratio on the oxidation of steel in the reheating furnace. These studies show that when the air/fuel ratio is decreased from 1.1 to 0.9, there is substantial drop in the steel oxidation. Further reduction in the air/fuel ratio has only limited effect. Normally the burners in all furnace zones operate at or slightly above 100 % stoichiometric combustion levels and the resulting time, temperature and atmosphere profiles as the product passes through the furnace is represented by the graph (a) at Fig 2. For substantial reduction of scale formation in the reheating furnace while heating the steel to rolling temperatures, it becomes necessary that the furnace is fired by burners operating well below the stoichiometric ratio of the fuel being used (such as in the range of 80 % to 90 % of the stoichiometric ratio and the flue gas atmosphere to contain CO and H2 as well as N2, CO2 and H2O in the soaking zone of the furnace. In order to burn down the combustibles (CO and H2) necessary air is introduced into the front end of the furnace to burn down the combustibles (CO and H2). The resulting time, temperature, and atmosphere profiles as the product passes through the furnace is shown by the graph (b) in Fig 2. The CO and H2 flue gas constituents are reducing to steel and when considered with the other flue gas constituents of CO2, H2O and O2. The flue gas mixture is either reducing or oxidizing to steel depending upon the ratio of CO/CO2 and H2/H2O and depending upon the surface temperature of the steel. The CO/CO2 and H2/H2O ratios are inversely proportional to the % stoichiometric ratio of combustion. Hence if the reducing atmosphere can be created in the soaking zone and converted to oxidizing atmosphere when the steel temperatures are low then there is possibility of scale reduction. Firing in under reducing conditions produces CO and H2 in the furnace atmosphere in equal amounts. This is in addition to CO2 and H2O produced under stoichiometric combustion. The CO/CO2 and H2/H2O ratios required for the reduction in the scale formation are a function of the surface temperature of the steel. These ratios, in turn, define the actual air/fuel ratio required at a given point in the heating. The CO/CO2 and H2/H2O ratios for a conventional heating furnace, where combustion is at or slightly above stoichiometric conditions, are zero, since no CO or H2 exists in the furnace atmosphere. The resulting atmosphere is oxidizing or scaling to steel.